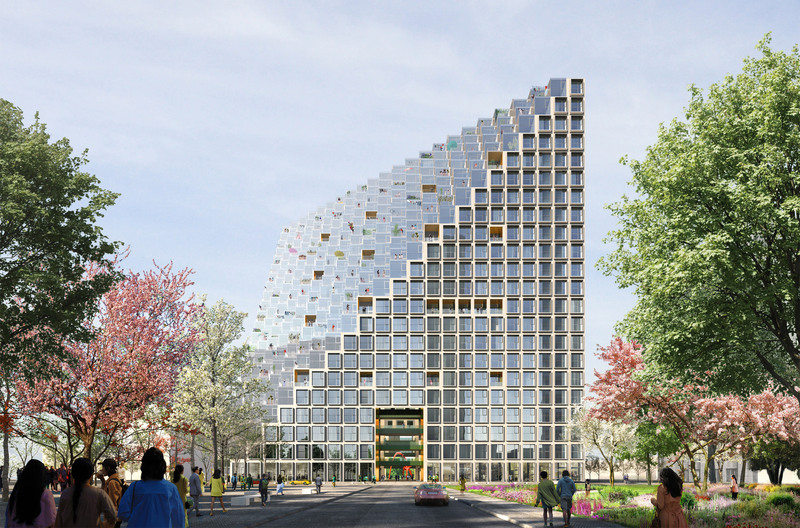 Cube-shaped balconies will form the terraced facades of the Xinhu Hangzhou Prism, which OMA has started building in the coastal city of Hangzhou, China. 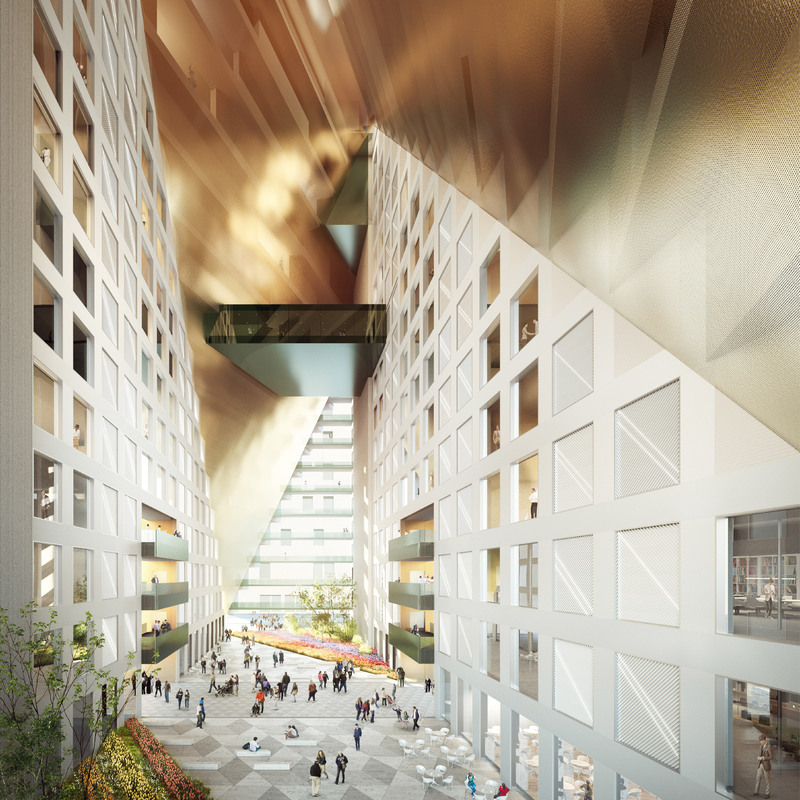 The 50,000-square-metre mixed-use building will host a hotel, retail space, apartments and a plant-filled atrium at its centre. It is expected to complete in 2020. Intended to resemble “a pinnacle reaching into the sky”, OMA’s design is modelled on the ancient Chinese proverb “above, there is heaven; below, there is Suzhou and Hangzhou”. When built, it will be distinguished by its asymmetric form created by two oblique facades that are lined with projecting cubic balconies. A large void will puncture the flat facades at ground level. This will house a publicly accessible “garden atrium” with water features and playgrounds. 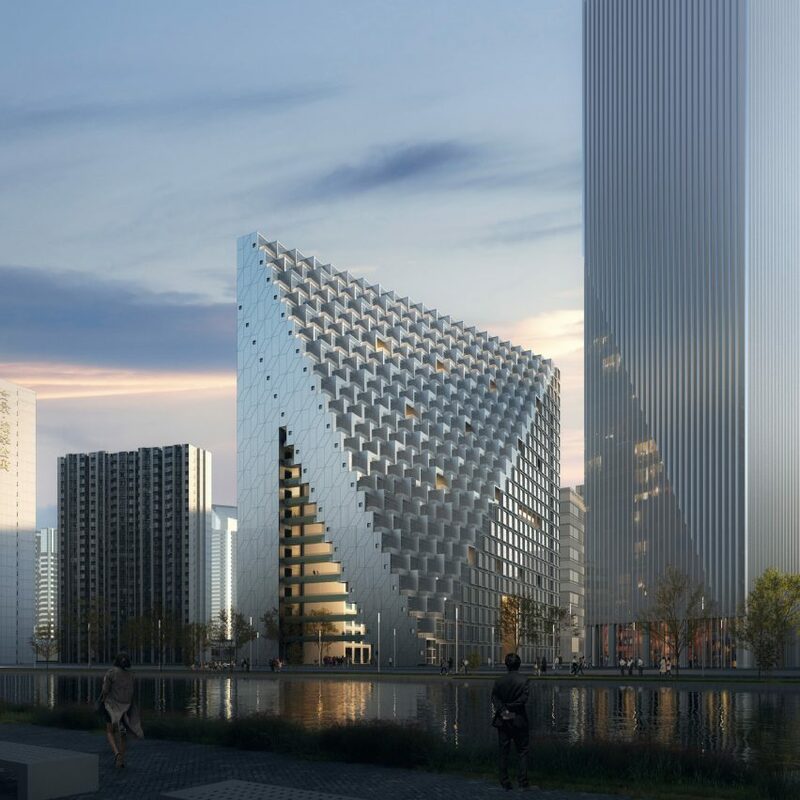 OMA’s visuals also show a new 35,000-square-metre residential tower that will sit adjacent to the Xinhu Hangzhou Prism and reflect its geometry in its facade. The project has been commissioned by local holding company Zhejiang Xinhu Haichuang Group to form the heart of its “future tech city” in the city’s new technology central business district, which is home to some of China’s largest technology companies. “Xinhu Hangzhou Prism will encourage the development of a creative community in the new Central Business District of Hangzhou,” said OMA partner Chris van Duijn, who is leading the project with Michalis Hadjistyllis. OMA’s proposal follows the completion of UNStudio’s enormous Raffles City Hangzhou complex, which forms a prominent landmark in the new central business district. Chinese cities are continuing to rapidly develop with 88 skyscrapers completed in the country in 2018. So far in 2019, Adrian Smith + Gordon Gill’s has revealed its proposal for the country’s tallest skyscraper, while Kohn Pedersen Fox completed a 400-metre-high supertall skyscraper in Shenzhen. The post OMA reveals visuals of Xinhu Hangzhou Prism appeared first on Dezeen.